This space wallpaper is an artist's concept of the snow line in TW Hydrae, which shows the water ice covered dust grains in the inner disc (4.5–30 astronomical units, blue) and carbon monoxide ice covered grains in the outer disc (>30 astronomical units, green). A snow line has been imaged in a far-off infant planetary system for the very first time as seen in this cool space wallpaper. 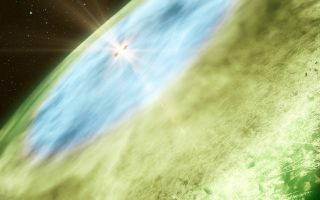 The image shows an artist’s concept of the snow line, located in the disc around the Sun-like star TW Hydrae, which promises to tell us more about the formation of planets and comets, the factors that decide their composition, and the history of the Solar System. This image was released July 18, 2013.